When will China’s economy start to slow? China reported a 6.8% year-on-year economic growth number for the first quarter. Again, the lack of volatility in the GDP data was striking. As the chart below reveals, economic growth has stayed within a bandwidth of just 0.1% since the final quarter of 2016. While this is suspicious at least, the real question is when China will let GDP growth come down, because it has to. There are a couple of reasons why China’s GDP growth will slow. First, over the last decade or so, economic growth has been driven by debt. The chart below shows the growth of debt of Chinese companies (black bars) against the growth of nominal GDP (blue bars). Growth in corporate debt has outpaced nominal GDP growth in eight out of ten calendar years since 2008, and in every year since 2012. The reason for comparing company debt with nominal GDP is that debt is a nominal metric. If inflation goes up, your debt will become smaller in real terms, hence we should also compare with a nominal measure of economic growth. 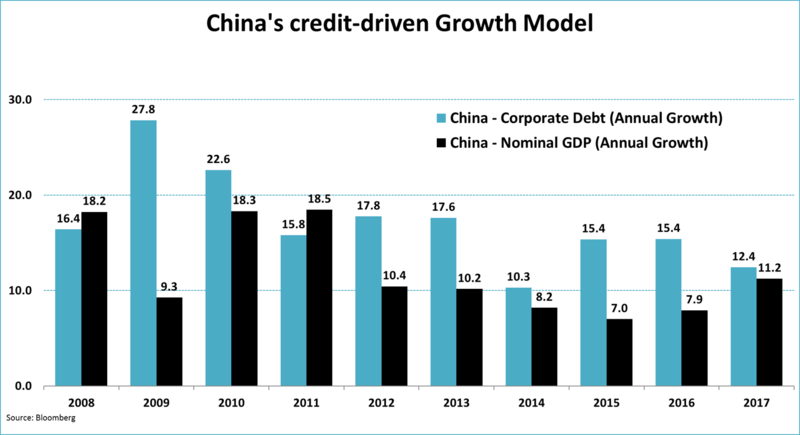 The result of all this debt accumulation is that in China the level of corporate debt as a percentage of GDP has risen to 160%. For comparison, in the US the level is around 45% of GDP. 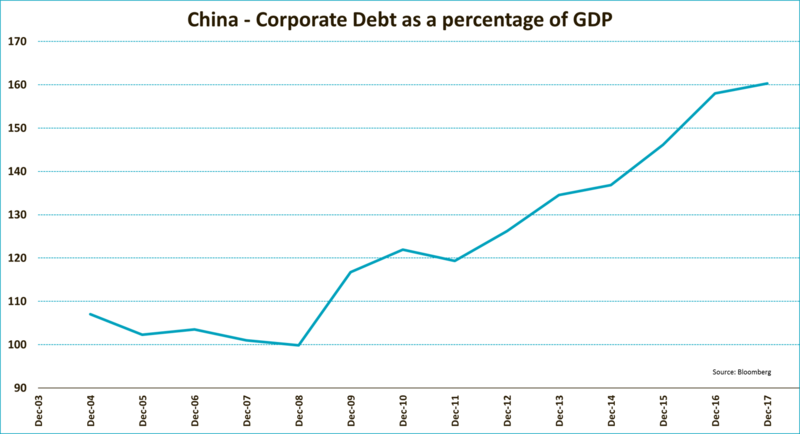 In many other economic regions corporate debt levels are significantly lower than in China as well. In the long run, this credit-driven growth model is unsustainable, as the pile of debt and cost that come with it start to hamper growth instead of driving it. The Chinese government is well aware of this, and has therefore introduced a wide range of measures to reduce debt growth. Hence, the gap between credit growth and nominal GDP growth has decreased, but has not (yet) been reversed. A second reason for slower growth is demographics. It was only a couple of years ago that the Chinese government abolished its one-child policy. It will take time for the effects of this ruling to become visible. In the meantime, China’s labor force will continue to decrease, bringing down (potential) GDP growth. A third factor is China’s goal to balance its economy. This means the share of the Chinese consumer will increase at the expense of investment. 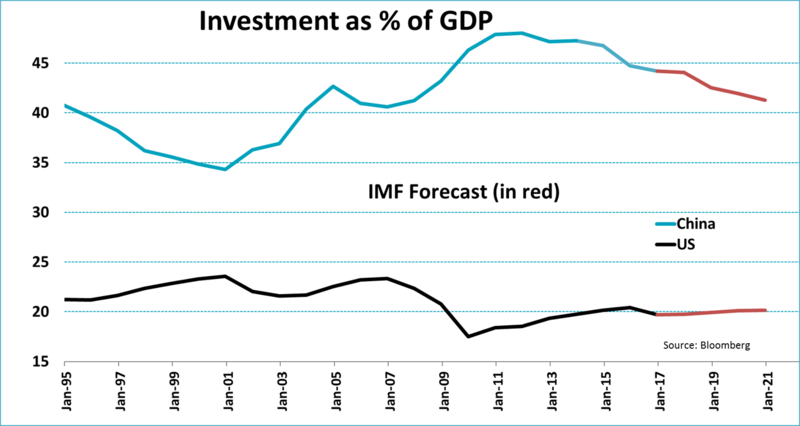 The chart below shows that investments still represent roughly 45% of GDP, whereas the percentage is closer to 20% in developed market economies. A rising middle class, higher levels of wealth, and perhaps also building fewer bridges to nowhere, will balance China’s economy. As consumer spending tends to rise less (but also much more gradually) than investments, China’s GDP growth is set to slow. Obviously, a slowing of the world’s second-biggest economy is not exactly great news. However, all the factors impacting growth mentioned above are clearly visible. We can see it coming. 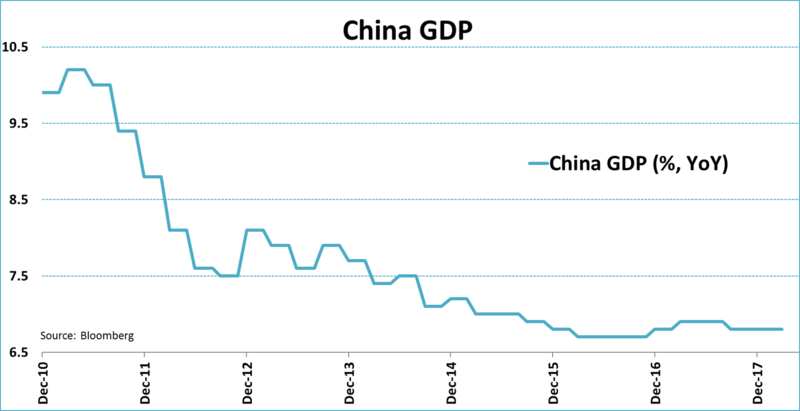 Also, because China is still growing at an impressive pace, the government has some time to adjust. Nominal GDP growth of 11%, as it was in 2017, implies the corporate debt-to-GDP level shrinks by roughly 15% per year when corporate debt is kept unchanged. To be clear, the odds of corporate debt not rising any further are basically zero, but the example shows there is room to get the debt-to-GDP level down if credit growth falls well below nominal GDP growth. In addition, household debt-to-GDP, is still much lower than in most developed markets. This does not mean there is little risk in China’s economy. Quite the opposite. The lack of volatility in published GDP numbers confirms economic growth is steered artificially. We just don’t know what China’s real growth number is. But it remains difficult to forecast when China will ‘decide’ to let its economy slow and by how much. We do know, however, that 160% of corporate debt-to-GDP is unsustainable, and growth will have to come down. The uncertainty surrounding China’s economic outlook could lead to an (unexpected) growth scare. Especially given that monetary policy, which pushed down interest rates all over the globe, has yet to normalize. Rising rates could prove to be a trigger for just such a growth scare. Therefore, expect China to be an important factor for many investment decisions, despite the difficulty at times in grasping exactly how the Chinese economy is performing.